A cheetah is fast and spotty too | More blue fabric? 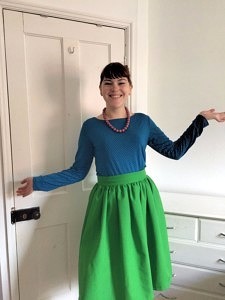 It’s a strange one today, as the finished item in question was a super speedy sew that was made up in the space of an afternoon, but somehow it’s taken the best part of three months to share it…. 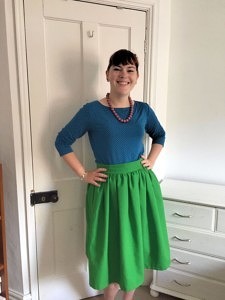 Part of that’s down to the item itself; whilst making for a very practical piece of clothing that’s great for throwing on during lazy weekends, it’s not so strong on the pretty photo stakes as a lot of my usual makes. So, without further ado, let’s get on with this! The fabric is a blue jersey with white polka dots that I got from the rag market. The Tilly and the Buttons Coco top. I went with the top length and full length sleeves. It was SO FAST. I’d heard good things about Coco and seen some lovely versions (Jo at Guthrie and Ghani was a particular enabler!) but had never got around to making it as I wasn’t sure if it was the pattern for me. I’m really glad I’ve rethought that. 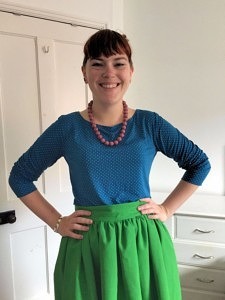 I finished the top as the pattern suggested, using a zig zag stitch and without an overlocker. I don’t like the zig zag finish and wish I’d used a twin needle as I think it would have looked more professional. I also think I could have sewn it up even faster (I know…) if I’d used an overlocked throughout rather than my regular machine. Yes. 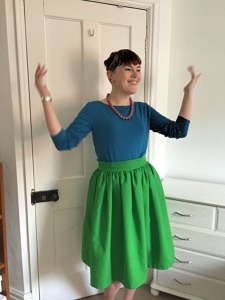 I’ve made a jumper version (which I’ll post about soon) and think it’s got a bit of potential as a go to for comfy tops. I’d also like to give the dress version a try, although I’m in two minds about whether or not the silhouette will be the right one for me. I really like this top! The colour is great and it’s such a classic.